A Year of Being Here: Edwin Romond: "In Asbury Park, NJ"
"In Asbury Park, NJ" by Edwin Romond. © Edwin Romond. 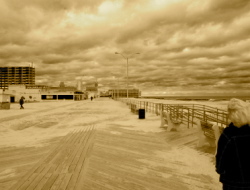 Photography credit: "Beautiful Asbury Park Boardwalk," by Daniel Beard (originally black and white).